managed to fırst scare both of thge cossacks away and then penetrated the back of the russıan army from both flanks. Forcıng them to sq ın 3 dıff locatıons. Thanks to Phıl for the great Combat. THe log fıle mıght be not perfect sınce we had some vassal problems. Especıally Phıl gor dısconnected several tımes. Thanks Togan. Score should be 7-3, rather than 6-3. Lots of fighting in and around the town, and alot on the French left flank, but no actual attempt by the French to take the town, and in the end it was not necessary. Lots if 1-block units on the board at game end. The French set up a Grand battery on the hills with the first command card they got two shots the rest of the game! With all the action around the woods on the French left Junot had LN shot out and retreated to a second LN. Todds Bayonet charge took out both French Cavalry and the banner count 4-2 Russians This left Jonot with a 2 block LN alone on the left A French Recon killed a Russian LN making it 4-4 banners and a very tight match. Junot then killed a Russian LT the fourth banner for the leader. 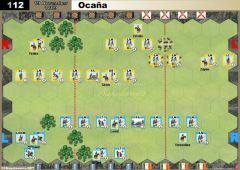 Acossack charge took out a French leader with double sabers and the match was tied at 5 each. The amazing Junot then killed his fifth unit a Russian MI. 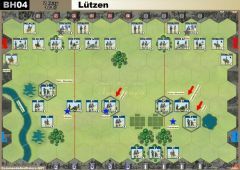 A French Bayonet Charge almost ended it but the LT survived. Todd saved a Elan to get the two banners he needed but the Art. mistook the Inf for cavalry and got no hits he rolled 4 cav dice out of five. The French ended it with a LT killing a one block Russian LT. This was a tough one Todd certainly played well enough to win. I fear Junot in the rematch!! The fıght started with the Russians moving in all fronts to take the city. Meanwhile the Cossacks prevented the right flank and kept the French busy for some time. 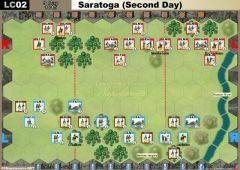 After lots of unsuccessful distant shooting on both parties, the Russians moved forward on their right center flank with the Grenadiers to destroy the French left center flank and their commanders. Finally the battle was won by the Russians, when their cavalary unit got encircled behind the Russian line and destroyed again by the Russian grenadiers. This was a tense game. The Russians and the French squared off at first. Then the French engages on the right and were bloodily repulsed back. 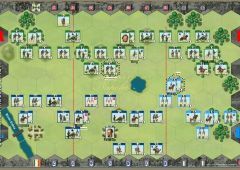 Most of the action was then in the center as the French rush toward to the town hexes. But, then, they started rolling up the Russian right. 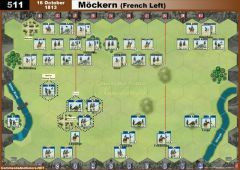 The French were very lucky in avoiding some artillery hits and the Russians held together well, having many of their one block units escape unscathed. There was a point when the French could have ended it a round earlier if they rolled a little better. But, ultimately the French prevailed with a well placed arty strike. Though the Russians showed thoroughly that they are made of heartier stuff than most men. After a lot of tense sparring on the flanks, the battle proper started around Utitsa. The French had worryingly advanced their artillery and line of infantry forward, and their LT made the western end of the village thanks to the Russian (moi) failing to leave a garrison unit there. Fortunately for the Russians, a timely Rally card followed by an attack which eliminated a LN plus General Kamienicki saved the situation, at least for the time being. 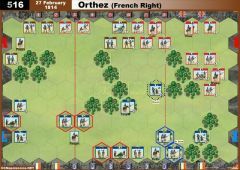 But with two Grenadier units disintegrating the French were slowly gaining the upper hand. A Forced March eliminated a third Russian infantry unit but then a counter with Fire & Hold and lucky dice eliminated one unit and sent the other scurrying back towards the rear. Situation saved, for now. The French artillery had advanced into the village and to the south, imposing on that side of the battlefield. But another counter which eliminated their left flank supporting infantry left them quite exposed. By this time the French units were looking piecemeal across the front. 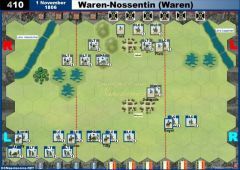 A desperate Bayonet Charge failed to push back any Russian units and two French infantry units themselves were reduced to rabble. One of those units was eliminated quickly, leaving the French one unit away from defeat. They attacked to the north of the village, pushed back the Russian infantry there, and occupied the rest of the village. But before they could claim that glory, the Russians attacked the remaining infantry near the hill and ended the battle. 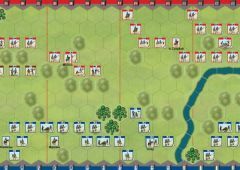 The battle was far more tense than the score would suggest, although the late French attacks cost them dearly. The battle was fought for most of the game on the French right flank. 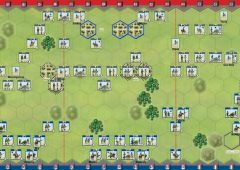 I lost count of the # of right flank cards I played as the French (8-10? ), and presumably John similarly was stuck with left flank cards. On the other side, and in the centre too, there was stalemate and, as such, the Russian Grenadiers were never in the battle until it was too late. On the French right the Cossacks and Russian infantry tried to gain the hill but the French were too strong. The French LC sabred what was left after the infantry firefight and chased off the Cossacks too. The early death of Tutchkov was a bonus that deprived the Russians on that flank of leadership. As more and more Russian infantry tried to stem the flow on that flank, so they were seen off too, as well as the Russian artillery being chased into Utitsa itself. In the end, a Bayonet Charge against the Grenadiers won the day for the French. Both games were played using Skype as well as Vassal, and both were in great spirit, with both players rectifying each others' mistakes. Thanks to John (EZP) for that. Last edit: 1 year 3 months ago by Bangla. The battle started with the French pushing the heights on their right, bagging a quick banner with ranged fire. The Russians turtled in this area several times, all the while moving their GRs into the forested region on their right. The French tired several times to push off the hills but the Russians kept pulling back into a tight mass. Something the French really did not want to get caught up in as the BB and following Russian turn would have crushed the light forces on hills. Slowly, the game ground down each sides forces. Seeing a chance the Russians started to push with their GR's and other Inf. support only to roll a bucket of red and yellow results. 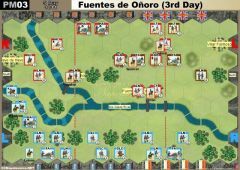 The already weakened French were able to range fire and bring down several Russian blocks. Not to be deterred the Russians pressed on with some mixed results...ever so hard tiring to even up the banner count. Unfortunately, for them, the French were holding the 'Give them steel' card and had 3 Russians units parked next to 4 French ones (one of which was a full strength Arty). The French took the lead here 5-4. 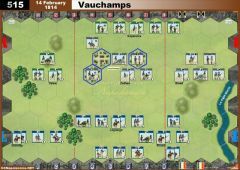 Not to let up (especially, since there were many 1-2 step French units about) Russia came back to even the score, which they did, but the French counter-attacked and bagged another banner and squared up another unit that was taken care of the following turn for the win. Good game, but longish for what it was. I think it was 3.5+ hours in the making....my eyes were falling out as it was a late night game for me after a busy day. Game 2 will take place soon enough. Russians pushed through the forest on their right and traded blows with French LN, losing 2 GR and 2 LT to French loss of two LN and leader on a 1 pt range strike and double sabers. French art killed Russian LT in town and French Lt cav harassed the Russian Right/Center until beat up and run off. Then Reinforced French right Forced marched over the hills and got last two banners. Well played to Mantra and like the last game, could have gone either way near the end. As the French, I wanted to attack on the Right flank, and bring up my artillery to soften the village. This worked to an extent, and my initial probes up the Centre were repulsed, and I pulled back to allow the Right to advance. Unfortunately the cards were not as cooperative as they could be. However, Greg determined to not cooperate at all, and Forced Marched what seemed like every Russian straight up the centre, landing a huge mass of Grenadiers on my centre position, and another set of Line on my Right flank. Some desperate times, though fortunate flag results and some artillery cannister put paid to the worst of it. I had fortunately picked up Assault Centre, which allowed me a riposte, and I must have killed off 2-3 units under Stroganov, but he got away each time. You know an attack isn't doing well when you are battling from you base line. At this point I ran out of Centre cards entirely, and despite trying to move the action to the flanks, Greg kept on hitting the centre and the banner score climbed to 5-5, and then 6-6, with chances for a win falling tantalisingly close but falling short. One particular chance was the last French cavalry 2 strength attacking a 1 strength Russian artillery. Greg whips out the Artillery cannister, and a CAV, FLG result disappoints us both. In the end Greg's persistence in the centre won the day, but the barest of margins. My dice warmed up for this one, and the Russian LT in the village sold himself dearly. 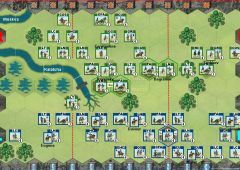 After that I seemed to simply play one reaction card after another, I had mostly cards I didn't want, Cavalry charge with 2 Cossacks isn't really much, and I had 2 Cav charge cards. Also held Cold Steel all game. In effect, the French came on in good style, and the Russians reacted, and on the whole the dice were good to me. Probably the key moment was playing a La Grande Manoeuvre which allowed two 1 strength Russians to escape, and put 2 full strength Grenadiers into the village, but also that Greg ran out of Centre cards at that point as well. As the score mounted, the French attacks grew more desperate, and the ripostes more fierce. Final roll was 3 Infantry hits out of 4 dice, just after Greg rolled 4 misses on a melee attack. Last edit: 1 year 3 months ago by Mark-McG.